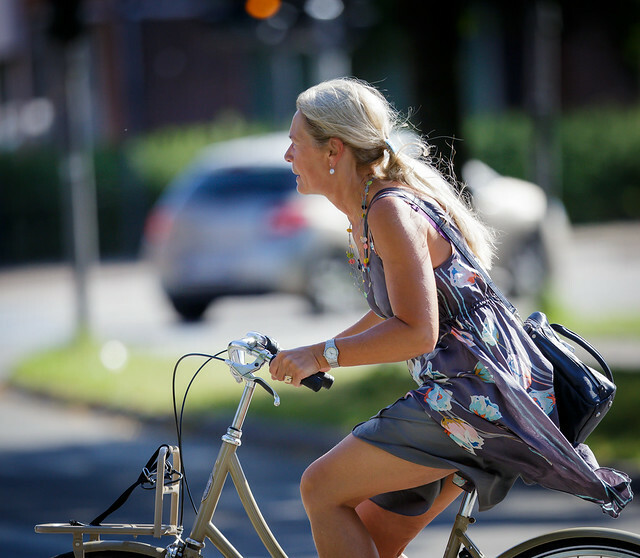 Lots of Copenhagen women grabbed the chance to roll out with in their summer dresses flying colors. Above, confident stride with classic dotted evening elegance. Below, one of this summer's favorite - bold colorful flowers. Lovely light dress with large flowers in simple patterns and colors. Ultra-light dark evening dress with matching necklace. Cool photos of nicely dressed ladies on bicycles - what more can a cycling enthusiast ask for? Hi! Do you know any urban biker community in Europe? Thanks!